We are back from our wonderful vacation in Hong Kong. It was absolutely fabulous, but before I tell you more about the trip, I have to go through my many, many pictures. Going from tropical heat to frosty temperatures was a shocker for me, but I also like the bright colors of Autumn leaves. While I am sorting out my photo collection, here is something that fits the season. 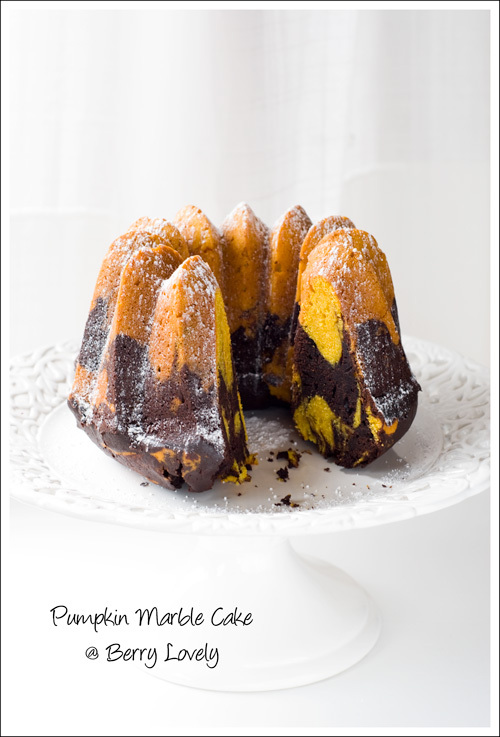 Seeing all the pumpkins around, I made a chocolate-pumpkin marble cake. I used Hokkaido pumpkin, sliced it, baked it, and pureed it, but you can also used canned pumpkin. It gave a brilliant yellow color, which matches very well with the chocolate. The cake was very flavorful, wonderful chocolaty, and moist even after a few days. I will definitely make this again. Preheat the oven to 180° C degrees (350° F). Grease and butter a 12-cup bundt-cake pan. In a large bowl, using a handheld mixer cream together the butter and sugar. Add the eggs, one at a time, beating well after each addition. Add the vanilla extract as well. Divide the mixture equally into two bowls. For the pumpkin batter beat the pumpkin puree into one half of the mixture until well blended. In another bowl, stir together 225 g flour, 1 tsp. baking powder, 1/4 tsp. salt, and 1 tsp. pumpkin pie spice. Add flour mixture to pumpkin mixture and beat on low speed until just blended. For the chocolate batter stir together the remaining 125 g flour, 1 tsp. baking powder, 1/4 tsp. salt, and the cocoa. Add the flour mixture alternately with the buttermilk to remaining plain batter, beating after each addition until just blended. Spoon the pumpkin batter into the prepared bundt-cake pan. Drop the chocolate batter by spoonfuls over the pumpkin batter. Gently run a fork around the center of the pan to swirl the batters. Bake for about 55-65 minutes, until a wood skewer inserted into center of cake comes out with a few moist crumbs attached. Let cake cool 10 minutes in pan, then invert onto a rack, lift off pan, and cool cake completely.